Path65 - Christmas Spectacular Show New York. Path65 was designed to operate multiple Flying Objects autonomously for choreographed flights through a defined 3D space and that with high precision. 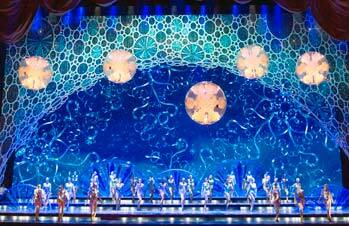 Path65 was behind the flying snowflakes at the Broadway show Christmas Spectacular at Radio City Hall. Shows have very particular requirements in terms of timing and choreography. With this new system stunning applications are possible like never before. Imagine for example a whole product range floating through the atrium of a shopping mall, maintaining its flight path and distance to one another at all times. Even more complex, flying objects could fly in formation like a swarm of drones. Path65 automates what would normally require a large team or even be impossible for human pilots. Make the air your stage. The Flying Camaro in Buenos Aires. Once more: Chevrolet wins with the flying Camaro the press award for the best exhibition booth at the Buenos Aires Salón Internacional del Automóvil (Buenos Aires Motor Show). That's three in a row after the press awards for Chevrolet at the car shows in Sao Paulo and Seoul, where the flying Chevrolets cars have been the main attraction of the show. The flying Camaro was transported from Sao Paulo to Argentina for this exhibition and our worries it might suffer during the lengthy overland transportion turned out to be unfounded. So it was flying time again. During the ten day car show we air-staged about ten flights per day filling Chevrolets stand time and again. A nice touch was the responsiveness of the Argentinian crowd who gave our pilot for every flight a big applause, especially for smooth landings. We loved it down there. The exhibition was located in the heart of Buenos Aires and gave us the opportunity to tune in a little bit into the groove of this beautiful South-American metropolis. The Flying Bumblebee Camaro attracted masses at the Chevrolet booth. If you think car shows in China are crowded, you don't know the Seoul Motor Show. Happening every two years, there must have been millions of visitors or at least it felt that way. For this year's mega event Gear Factor has designed a Flying Camaro for Chevrolet's large booth featuring a bunch of new models. The Flying Car had the same iconic design, yellow with black stripes, as the famous Bumblebee in the movie Transformers. If there would have been a price for the most photographed object at the car show the Flying Camaro would have outright won it. We (air-)staged 10 choreographed flights per event day and filled Chevrolet's booth time after time. Operating over such large crowds comes always along with a good portion of suspense for us. The Gear Factor pilot team had to proceed with utmost concentration to maneuver the Flying Camaro in greater distances around the large stand avoiding obstacles and maintaining a safe height above hundreds of heads consistently. You can find a video of all the action here.